Jerome Avenue Rezone Proposal: BronxTalk Examines It Again Tonight (Part III). Tonight’s BronxTalk will feature the proposal to rezone and rebuild 75 blocks on and around Jerome Avenue from 165th to 184th streets. It’s the third edition of the program in the past five weeks that will be dedicated to this important and controversial project. Several groups have begun organizing to make sure the neighborhoods surrounding Jerome Avenue play a role in determining what zoning changes, if any, are eventually made by the city. CASA, Northwest Bronx Community and Clergy Coalition, Latino Pastoral Action Center and United Auto Merchants are among them. Tonight’s show will feature the district managers of Bronx Community Board’s 4 and 5. Hosted by Gary Axelbank, BronxTalk is seen live Monday nights at 9 p.m on BronxNet’s channel 67 and Fios 33. Though the Daily News reported on Sunday that State Senator Adriano Espaillat, a challenger to longtime Congressman Charles Rangel, won’t appear on a BronxTalk debate “due to Albany’s legislative session,” host Gary Axelbank told Bronx Matters today that Espaillat has decided to take part. Meanwhile, Rangel’s office asked Axelbank for a conference call “for rules and other debate procedures” along with staffers of the other candidates. Axelbank responded by setting that up for 2 p.m. today. Stay tuned on Bronx Matters for debate status update. Councilman Fernando Cabrera announced to tenants of NYCHA’s Ft. Independence Houses in Kingsbridge that its community center won’t be closed, according to The Riverdale Press. Cabrera said NYCHA confirmed that but the Riverdale Press said that “in in recent e-mails, NYCHA’s press office said a determination was yet to be made about the authority’s 106 community centers.” It’s a citywide issue: “The way Mr. Bloomberg left the centers last year, the city would end funding for 57 centers operated by NYCHA itself this June. Nonprofit agencies support the other 49 sites,” the Press reported. Speaking of NYCHA housing, the Bronx Times reported on the agency’s new commissioner, Shola Olatoye, meeting with residents and local politicians at Pelham Parkway Houses and getting an earful of complaints about long delays making critical repairs — a chronic, unresolved problem during the Bloomberg administration. State Senator Jeffrey Klein and Assemblyman Marcus Crespo (both Bronx reps) are partnering on legislation to keep alcohol out of the hands (and mouths) of underage drinkers by allowing retailers to swipe bad IDs among other efforts. The Daily News reports that 400 minors were admitted to two city hospitals — North Central Bronx and Jacobi — just over Memorial Day weekend in 2012 and 2013. Hunts Point Express files a detailed report on the possibilities for the rebirth of waterfront land where a decrepit Marine Transfer Station in Hunts Point is expected to be torn down. 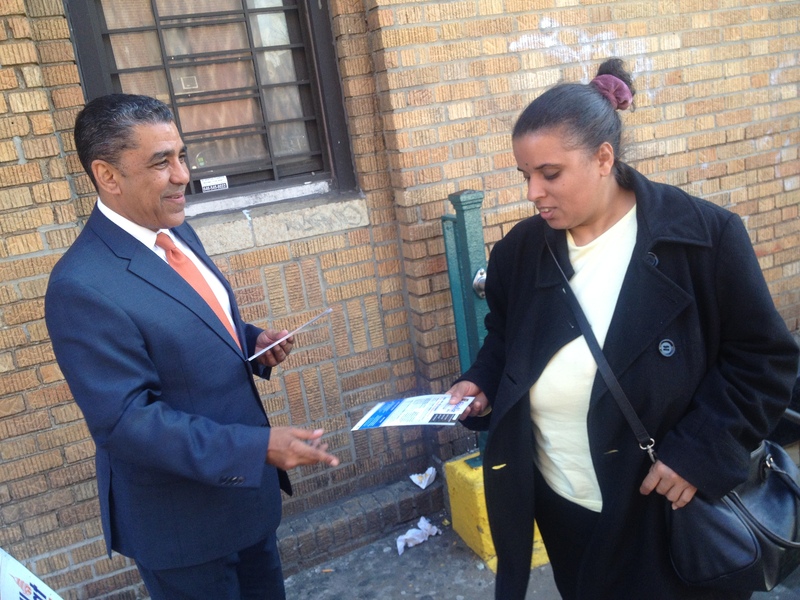 Naomi Rivera declined to participate in the 80th Assembly District debate on BronxTalk on Monday night. Unfortunately, although we had worked very hard to coordinate the schedule for this debate with the incumbent, Naomi Rivera has flat declined our invitation to appear. Editorially, I will say that asking people for their vote and then not be willing to participate in a debate with other candidates is a posture that we reject wholeheartedly. The Bronx is made stronger by responsive elected officials who respect the democratic process, their opponents, and most importantly, their constituents. By refusing to appear tonight the assemblywoman is directly insulting everyone involved, BronxTalk, Bronxnet, her fellow candidates, and you the people of the Bronx. In fact, it’s the second time she has declined to participate. Viewers will remember she didn’t appear in 2010 either. Given this program’s ongoing commitment to keeping Bronxites informed and engaged, we abhor the very notion of it. And so she will be represented by an empty chair throughout tonight’s proceedings.